Padauk (Pterocarpus soyauxii) is a bright orange color when it’s freshly cut but quickly fades to a pretty reddish brown with exposure to light. The sawdust is strangely sticky, clinging to everything it touches, metal, skin, clothing, etc. This makes it somewhat difficult to work with because the dust tends to pile up on my knives as I work the lathe. I can’t pour or blow it off like other species and have to push it off with my fingers. However, it turns beautifully and takes a very nice finish. One of the things I really like about Padauk is its characteristic called chatoyancy – which is the appearance of depth in the finish. 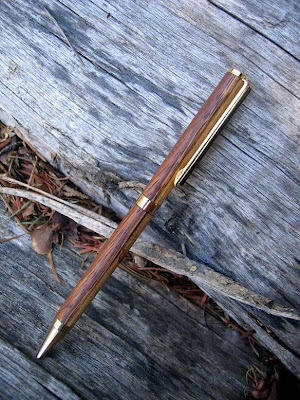 It has a 3-D effect when you look down into the wood, like you’re looking through its surface.This is the largest pen I’ve made to date, ideal for someone who is looking for a pen with a lot of well-balanced weight. Mechanism: Parker style rollerball with a rhodium-plated pen nib and premium Schmidt steel cartridge refill with a ceramic point. There’s a Swarovski crystal in the clip for an added touch of flair and all the furniture is cast, then plated with titanium nitride for an extremely durable finish. Finish: Hand sanded through 400 grit, then 00 through 0000 steel wool for a fine polished surface. The finish is mineral oil, bee’s and paraffin waxes melted onto the surface and polished in with a soft cotton pad. This pen was one that I’d actually forgotten I had a kit for. I was looking through my stock of kits for something else when I found it. The bushings that it requires to make as well as the necessary drill bit were also present, so I was set. I had some Padauk (Pterocarpus soyauxii) from an earlier project in the day and decided it was the wood to use. Other than the sawdust sticking to everything, Padauk is nice to turn. It smells pleasantly of a spice I can’t place and doesn’t require a lot of care at the lathe. Some woods you really have to babysit but Padauk isn’t one of them. The barrels on this pen are fairly thick, so if you like a pen with a larger diameter and some weight, you’ll like this one. Mechanism: Parker style double twist pen. The point rotates out if you twist the pen in either direction. If you prefer gel pens, you can simply swap out the original insert for a gel insert. Finish: Sanded to 400 grit, then 00 through 0000 steel wool. Mineral oil, bee’s and paraffin wax. Ifil wood makes some of the prettiest pens I’ve made. This particular piece was harvested about 23 years ago on the island of Guam by my brother. He brought me a a long thin chunk of it some time ago on a trip up here, and I’ve made several pens from it. There is a sharp distinction between the sap wood and heart wood, and a huge difference in density of the two. The sap wood is the lighter color, and has about the same density as balsa wood, and the darker heart wood is very hard. The sap wood has also spalted, which is caused by a fungus that makes the dark lines in it. This makes it difficult to turn on the lathe because the knife cuts into the wood at different rates. The solution to this is to use very sharp tools, and soaking the workpiece in cyanoacrylate (CA) glue. Doing so effectively plasticizes the wood, making it much easier to turn. 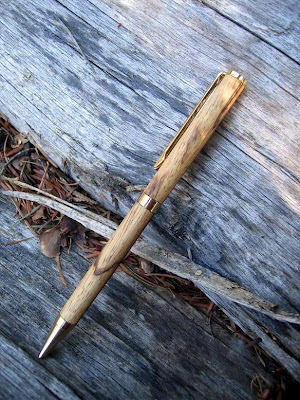 Another view of the pen showing the heart wood side and the line between it and the sap wood. Madrona (Arbutus menziesii) is known as Madrone south of the Siskiyou mountains on the California / Oregon border, Madrona to the north, and Arbutus up in BC, Canada. It’s also the only broad leaved evergreen in Canada. This particular piece came from my brother’s back yard in Gold Hill, OR. This particular pen was sold for a father’s day gift to a client in SE Asia, Madrona is popular there because it can’t be found anywhere in Asia, so it’s unique. In fact, it can’t be found naturally outside of the Pacific Northwest. One of our favorite sailing destinations has lots of Madrona all over the island. Black & White Ebony (Diospyros embryopteris) is one of the prettier woods I work with and when it’s paired up with a solid piece of chromed steel, you can get some striking looks. This bottle stopper was made after a conversation with one of my best friends. I’d made a wine bottle stopper for her some time ago as a gift, but it was too tall for the capped bottle to fit into her fridge. She reminded me of it recently, so I gave this stopper a wide button shape instead of the long hand-gripping shape we normally see. The stopper is equally useful for protecting your oil, vinegar and other liquids in storage bottles, and adds a touch of class to your kitchen counter. Materials: Black & White Ebony wood, chrome steel, silicone O-rings which help seal most wine bottles. This pen is made from Ipé (Tabebuia chrysantha) which is incredibly dense, so much so that it won’t float in water or sustain a flame. I made it with matte black fittings so it’s very understated while still stylish with a nice weight. I really like turning Ipé because it takes an incredible finish, even though the silica in the wood is tough on my tools. You have to sharpen your tools much more frequently when you’re turning it. Mechanism: It’s a Cross style ballpoint with a twist mechanism. The fittings are a matte black with an epoxy coating for a very durable finish. Replacement inserts are available at any office supply store.